Stay Local: Experience all the Boston Public Library has to offer. The multidimensional Boston Public Library in Copley Square is not your typical library - , offers offers way more than a grandiose study center and over 450,000 books to quite literally- check out. No, the this historic monument located on Boylston Street offers much more. The building in itself is a modern luxury with a high tech community learning center and a WGBH satellite news bureau and studio lounge. Not complex enough? The modern renovation completed in 2016 also offers a state of the art lecture hall, café, wedding venue, afternoon tea and more…. The Boston Public Library was established in 1848, noted to be the first large free municipal library in the United States. In 1986, the National Park Service cited the building to be “the first outstanding example of Renaissance Beaux-Arts Classicism in America” and designated the building a National Historic Landmark. Today the central building is composed of 2 two connected wings:, The McKim Building and the Johnson Building. ; The Johnson building, modern era wing, opened to the public in 1972 with and renovations were completed in 2016. The new renovation was intended to mirror the McKim Building and highlight the buildings most beloved features of the building, with a serene courtyard that connects a historic marvel to modern design. The Central Library’s courtyard is a popular place for artists to take out their easels and sketchbooks and let their work flow from the inspiration surrounding them.- The open plaza features marble and, greenery, centering centered on a pool and fountain. Artist- or admirer, everyone can admit enjoy the marvelous beauty the courtyard has to offer. The library’s history is an additive a perfect complement to the distinguished features of the Boston Public Library provides. The Johnson building features a WGBH studio on the first floor with a prime location right next to the café. Is there anything better than stopping by to listen to a podcast and sip on a latte, or enjoy a warm bowl of soup on a rainy day? 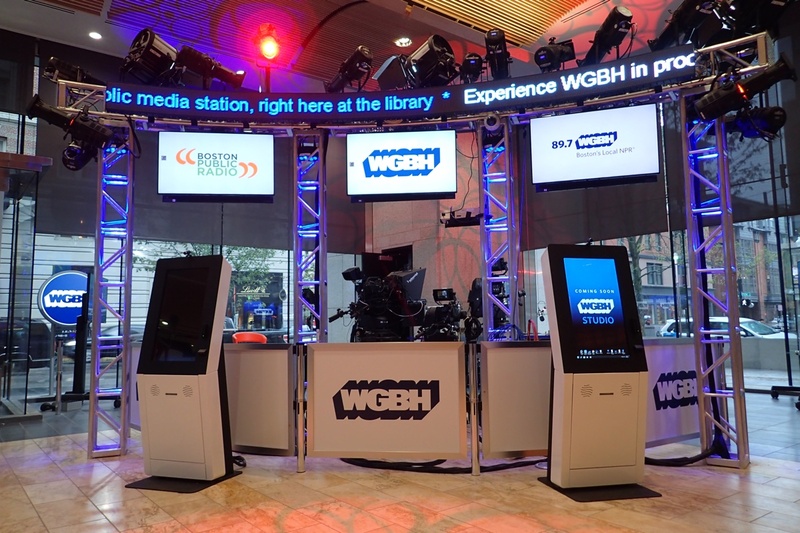 The studio features weekly tapings of the Boston Public Radio in addition to public events, so be sure to check out the WGBH event calendar for a list of the upcoming programs! Those looking for something more special; can enjoy an afternoon of calm and conversation and the outdoor courtyard over the afternoon tea time at The Courtyard Restaurant. Here, you can enjoy savory tea sandwiches, petit fours, tea scones, and once in a while, a fashion show. Modern meets historic is a. A theme of the connected buildings. The adjacent building to the Johnson building of the Boston Public Library offers a regal atmosphere. Entering the tall wooden doors of the building will are an entrance take you to another time. The entrance features Italian style archways, mosaic tile ceiling, and marble floors. If that’s not enough to take in, ascending the staircase of the building will lead you to one of the most striking features of the library, the pair of marble lions that greet you at the top of the staircase. The superstition behind the lions is that rubbing the tails will bring one good luck- so for those who utilize Bates Hall as a study room , it can’t hurt to rub those tails before an exam! The McKim Building is the most raved about venue location in the city, offering an atmosphere to that appeal to the all senses. Surrounded by larger than life murals- the atmosphere will take your breath away. French painter, Pierre Puvis de Chavannes, noted to be one of the most talented muralists in the 19th century, was commissioned to paint a mural at the Boston Public Library. The murals in the Puvis de Chavannes Gallery of the McKim Building represents the artist’s only mural work outside of France; his work features eight panels that surround the main staircase. 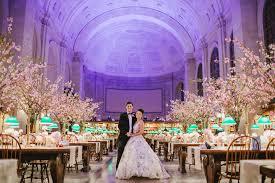 It is truly no surprise that the McKim Building is one of the most sought after wedding venues in the country. 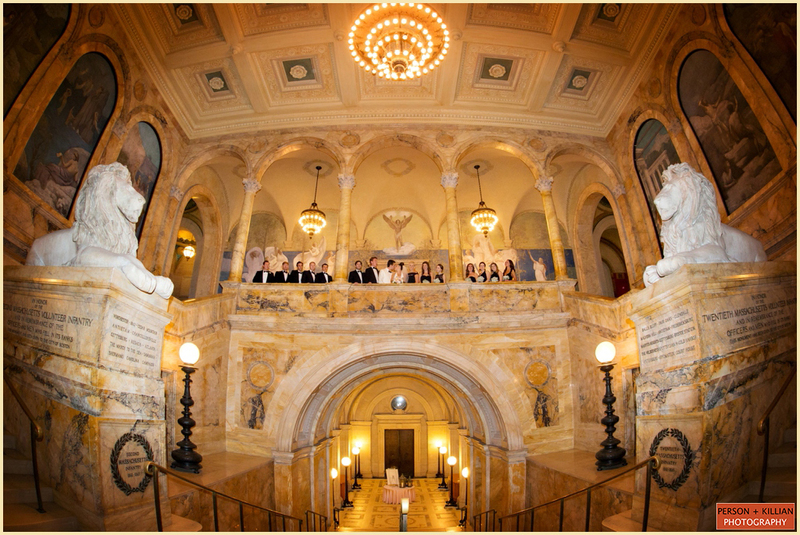 Word of advice, if you plan on having your dream wedding here, better make sure to book the McKim Building in advance! The library is transformed into a fantasy venue straight out of a fairy tale. The atmosphere is one like no other location can beat. Any Boston local will attest that witnessing a beautiful couple smiling on the outside steps of the McKim Building is a common occurrence when walking down Boylston Street. Be careful not to photobomb! Whether you’re more intrigued by the historic or modern features the library has to offer, visiting will surely suffice pique you interests. The Boston Public Library is a must -see location when visiting Boston- you will truly not leave disappointed!